If you are coming to visit Sorrento and the Amalfi Coast during the Christmas period, follow the itinerary of the nativity scenes set up in the old town and Museum Correale to discover one of the most authentic traditions of Sorrento culture. The art of nativity is part of Neapolitan culture from the XVII century and it started with the representation of the birth of Jesus Christ by professional artisans. In the heart of Sorrento Old Town, inside the Sedil Dominova (which hosts the headquarter of the Societa Operaia di Mutuo Soccorso) is set up one of the most fascinating nativity scenes of the Sorrento Peninsula. Visitable from the beginning of December, its size is approx. 10 s.m. and it is made every year in a new version. Besides the beauty of the nativity scene and its scenographies, the glance is given by the surrounding context: the sedil dominova is the only ancient noble seats that can still be admired in Campania. 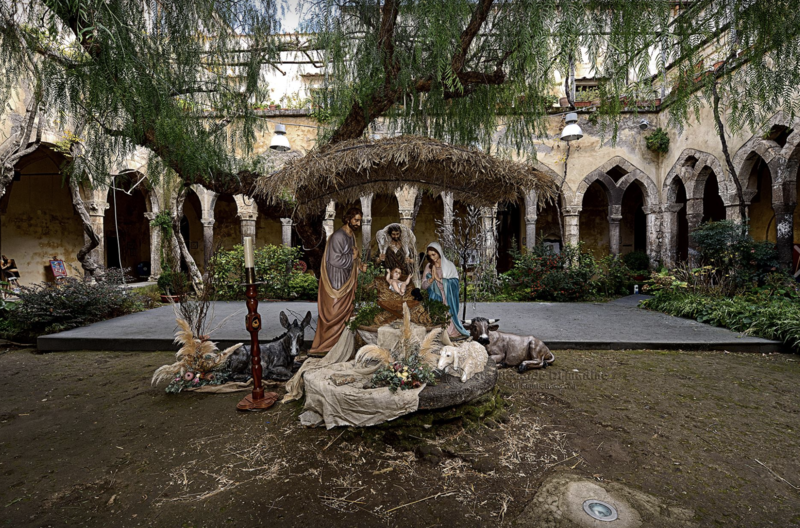 Located in the cloister next to the Church of the Madonna del Carmine, right in the heart of Piazza Tasso, its Nativity scene is one of the most visited and appreciated in Sorrento. Iits size is approx. 40 s.m and it is characterized by a realistic scenography showing all aspects of Sorrento’s life and traditions with the use of over 100 shepherds of various sizes and breathtaking landscapes in the background. Considered as a small jewel of the local craft, the Nativity scene set up in San’Antonino Church can be admired all the year and it is inspired by the scenographies of the ancient Sorrento: the ruins of the Roman aqueduct of Antonino Pio, the windows of the ancient Palazzo Correale in via Pietà, from the beautiful fountain of Piazza Castello to the ancient descent with the original door of Marina Piccola and the Greek port of the Marina Grande. Following the earthquake of 1980 there was a sensational robbery, some thieves stole all the precious shepherds and statues with their accessories. From December 8th until January 6th, the Museum Correale will host for the first time the nativity scene realized by the Sorrentine Masters Antonino Paturzo and his son Valentino as symbol of the important religious and cultural value that the nativity covers in the local craftsmanship. Open to the visitors from 9.30 am to 6.30 pm (closed on Mondays), it will be possible to admire eighteenth-century scenographies and pastors of wood and ceramic, with the use fabrics similar to those of previous centuries. Well known for the famous black procession of Good Friday in Sorrento, the Church of the Servants of Mary in via Sersale, preserves a real treasure of art: forty pastors of the Seventeenth – century of different dimensions. In a little chapel on the right side of the high altar, next to the historical shepherds stands the statue of the Child Jesus: carved in wood, it is one of the most precious pieces of the collection. Inside Gambardella deli (Corso Italia 63), one of the most appreciated in Sorrento, amid the scent of salami and local cheeses there’s a characteristic Neapolitan Nativity that has now become a place of pilgrimage for local people. The “Gambardella” nativity is a private collection made by Federico Iaccarino. Its style is typical of the eighteenth-century with 40 figures finely modeled by hand. Lucky Store, a furniture and beautiful ceramics store located in Piazza Antiche Mura, near the Bastion of Parsano, is the main local Nativity Scene made by a private and open to public visitors. The precious statues, patiently collected by Carlo Cuomo over the years, start from a maximum size of 20-25 centimeters which decreases due to the depth of their positioning, in a unique and fascinating setting.